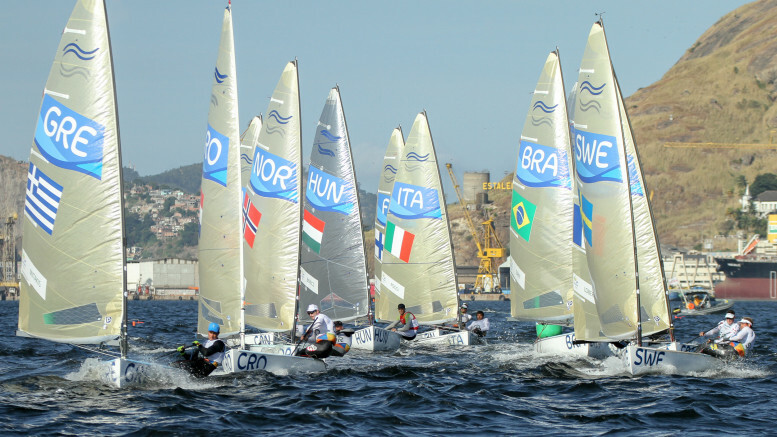 Rio de Janeiro – Finnclass – With just three races to sail at the Rio 2016 Olympic Sailing Competition, Giles Scott (GBR) has extended his lead to 17 points in the Finn fleet after a clinical performance on Saturday in Guanabara Bay. Vasilij Zbogar (SLO) stays in second while Jake Lilley (AUS) rises to third. The day belonged to these three, the only sailors to get two low results all day. But the racing was just so incredibly close, and it could have been a lot different. After 50 minutes of full-on racing, these world-class athletes were separated by just seconds. No one gives an inch. Every inch is fought for with incredible determination. There is no let up until the line is crossed. The right-hand side was clearly the preferred choice on the Ponte course today, but the reality was subtly different with gains to be made on the left and also the middle. Lilley led round the top mark in race 7, but Scott soon took the lead downwind to extend around the course for a 30 second win, the biggest boat to boat margin of the day. Behind him it could not have been closer, with the whole fleet no more than 70 seconds apart. There were some big moves within the fleet though with Jorge Zarif (BRA) coming through from 15th at the top to take second place at the final downwind mark to lead Lilley into the finish by just three seconds. Race 8 was almost as close, with all boats finishing within 100 seconds. Jonas Høgh-Christensen (DEN) found the top mark first after favouring the left side, but it all went horribly wrong from there in, losing 15 places before the finish. Pieter-Jan Postma (NED) rounded in second and took the lead on the first downwind, never to be threatened again. Josh Junior (NZL) was the biggest climber, coming through from 11th at the first mark to second at the finish, while Scott extended his lead overall with a third place finish. Ivan Kljakovic Gaspic (CRO), triple European champion, has been steady most of the week, but now his consistency is seeing him rise though the ranks. He ends the day in fifth overall. Caleb Paine (USA) was reinstated into his second place in Race 6, following new video evidence produced overnight. He now moves back up to seventh overall, and within 12 points of the podium. With just 14 points separating seventh to 14th, there is still some tough racing to be done. Racing for Finns continues on Sunday with two more races on the Niteroi course area outside the bay to conclude the opening series ahead of Tuesday’s medal race.